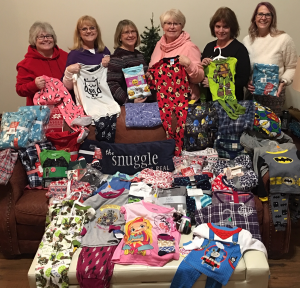 The GFWC Illinois Coal City Junior Woman’s Club was excited to have a new pajama collection project this year: Wear One Share One. They put collection bins around the community to drop off new PJs for those who don’t have warm, snuggly and toasty jammies for bed. It came in the nick of time for the brisk winter they had! They collected sizes from infant to XXXL, for males and females – and even had 2 PJs for dogs! 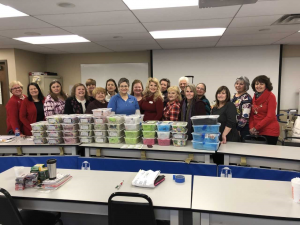 Their goal was 125 pajamas in celebration of GFWC Illinois’s 125th Anniversary. They ended up collecting 147 pairs with help from $165 in cash donations. They were moved by the generosity of their community, and whenever they went to empty the bins, it brought tears to their eyes. It’s a project they want to share and repeat year after year. Phyllis Skubic, Melissa Alstott, Terri Tatroe, Club President. 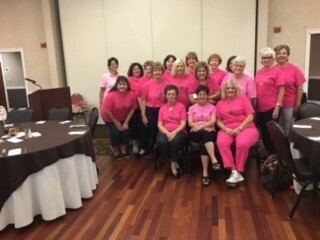 GFWC Luzerne County (Pennsylvania) recently held its board meeting at Misericordia University. Members from all five area clubs attended and participated in the Jared Project. The Jared Project started in 2001 to honor a young boy, Jared, who was undergoing cancer treatment and wondered why other children did not have any toys or things to do while in the hospital getting treated. Jared boxes are plastic storage boxes filled with toys, books, crayons, stickers, games, and puzzles. They are given to a child when admitted to the hospital. Each box contains items selected for a specific age and gender. The goal is to lift spirits of children in the hospital. 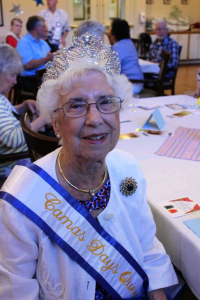 GFWC Camas-Washougal (Washington) is honored to host various activities honoring the current and past Camas Days King and Queens. The town of Camas, Washington does not celebrate the traditional 4th of July. Instead they celebrate Camas Days the “weekend” of the third week in July. The first official Camas Days were celebrated in 1981 with the crowning of Earl and Faye Miller as King and Queen. Their daughter Maxine was the first Junior Camas Days Queen. Thirty eight years later, Maxine was crowned the Queen of Camas Days. 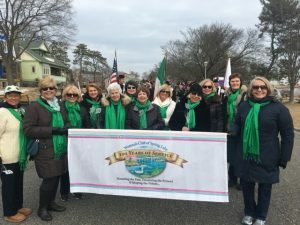 The Woman’s Club of Spring Lake (New Jersey) marched in their St. Patrick’s Day parade. Their local paper published a beautiful half page colored photo of them holding up our Centennial Banner. Parades are an excellent way to make your club visible in the community!